First of all, I would like to wish you and your family a very merry Christmas! I've had an incredible two days with family and friends and I hope you've enjoyed the same. 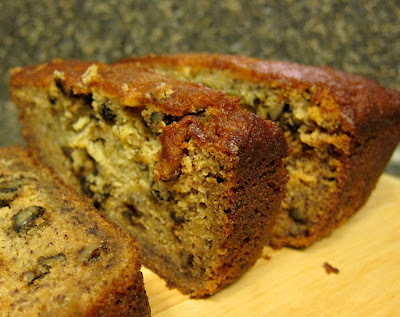 Today, I am sharing an incredibly moist banana bread, complete with butter and heavy cream. (Oh yeah!) Tomorrow, I'll be sharing an incredible way to take this banana bread from bake sale to upscale- so stay tuned! 1. Preheat oven to 350F. Use a non-stick or greased 9×5×3-inch loaf pan. 2. Beat butter in large bowl with an electric mixer set at medium speed until light and fluffy. Add both sugar and beat well. Add eggs, egg whites and vanilla and beat until well-blended. Add mashed banana, beat for 30 seconds on high speed. 3. Add all dry ingredients in a separate bowl and add this mixture to the banana mixture, alternatively with cream. Add walnuts, mix well. 4. Pour batter evenly unto the prepared loaf pan. Baked until browned and toothpick inserted near center comes out clean, approximately 1 hour to 1 hour & 15 minutes. 5. Cool completely and serve. To store, cover tightly with plastic wrap. Bread becomes more moist after resting overnight.